Buck is one of the popular and respected brands of hunting survival knife. They are always ahead of everyone to bring variation in knives. Their motive is to make your life easier both in indoor and outdoor. Though we all know that Buck is well-known for their folding knives, when it comes to the fixed blade then you may consider Buck Knives 120. What is good about Buck Knives 120 General Fixed Blade Knife with Leather Sheath? Hoyt Buck’s made his first fixed blade knife from a worn-out in 1902. But Buck 120 came out in the 1960s, which developed as a trend among the collectors. This knife is an exceptional choice for hunters or regular user. The clip point at the top of the blade is too sharp and thick. This 7-3/8” clip point has excellent strength and edge retention. Clip-point blade makes de-scaling a lot simpler. 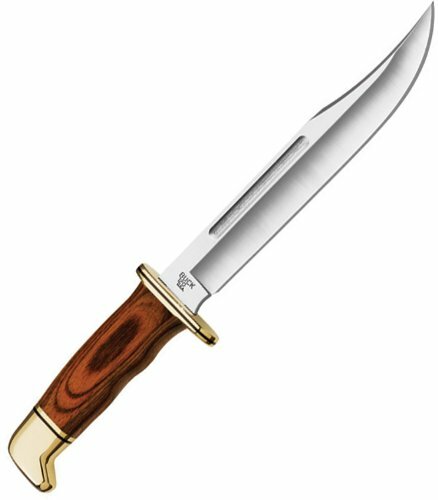 This is an exceptional choice for making a hole in the belt, hunting knife, cutting sharply, and effective for detailed work. Buck 120 has full tang construction with integrated finger guard. Also, the deep Choil makesit superior among hunters. Overall, the classy design makes it one of the best option. This hardwood cocobolo handle has curves, and palm swells texture. This combination provides better grip and comfort. In outside brass, the guard looks a combination of beauty and balance. This standard stainless steel material is the wear resistance of carbon alloy while providing corrosion resistance. That ensures durability and wear resistance with excellent strength. Also, the blade is easy to sharpen to improve performance. Buck provides the high-quality protective leather sheath with snap fastener. You can easily carry it anywhere and give thanks to the integrated belt loop. This is why Buck 120 general is a great choice among hunters. Whether it is the design or the quality, there is no alternative of buck knives. What is the lacking of Buck Knives 120 General Fixed Blade Knife with Leather Sheath? We didn’t find any strong reason that we can consider as deficient in Buck 120 general. Still, to be honest, here we find a few issues to consider. We find about a 1mm gap between the handle and the guard. They could have installed it more carefully to avoid the chances of open up. Though the blade is very sharp, the blood grove looked like router grove, but we think these are a minor issue that we may overlook for a quality blade. Whether you are planning to use buck 120 general for hunting or regular use. We assure you that it won’t disappoint you anyway. That’s all our exploration about Buck 120, which proves that it’s the best in the market. Now it’s your turn to consider. SureFire 6px Tactical Review Do you waste a lot of time outdoors?